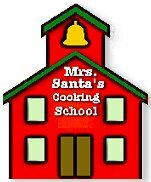 to Mrs. Claus' Famous Cooking School. Here you'll find the best in Christmas recipes from Mrs. Claus and her friends. In keeping with the theme of my new cookbook, my tip for the holiday season is: Keep it simple! By all means feed them and feed them well, but don't lose sight of the fact that people come first! No one will remember the handmade chocolate flowers on your exquisite Yule log dessert, but you can create real memories by providing a relaxed atmosphere for camaraderie and good cheer where family and friends freely interact. This means, plan it carefully to make sure you are not locked in the kitchen, so that you can be relaxed and enjoy the festivities. Decorations, elaborate food preparation, gifts and parties are nice, but should be secondary to what the season is all about: Togetherness and Peace.